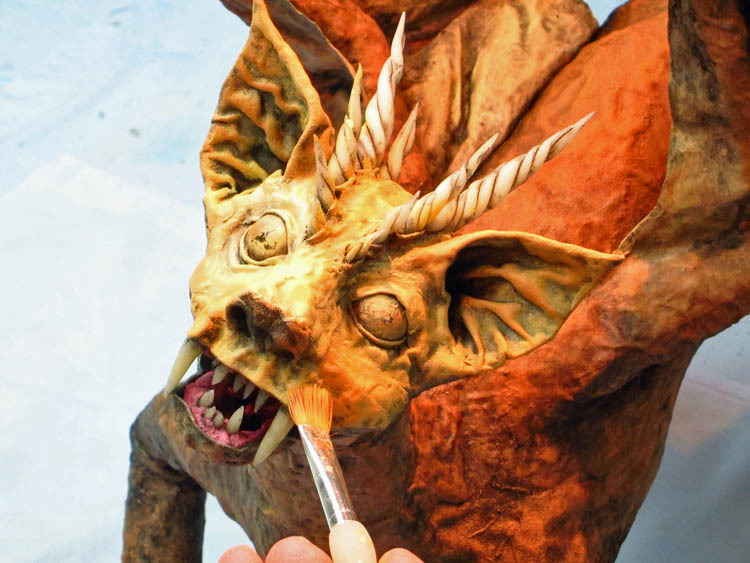 ← Paper Mache Dragon-like Cat – A Head! Hey everyone. Well, it’s time to finish this series of posts. I know that you know that the project is already finished. So these posts needs to catch up. If you don’t care about process, just hop to the bottom of the page and check out the video. I provided a link to the Facebook upload and another to Youtube (in case you hate Facebook with its evil, sneaky, non-private privacy policies). I appreciate your patience. I was busy finishing my latest dragons at the same time I was making this. We left of with a masking tape face. So I added the cloth mache to the rest of the project. Then I did the initial paint job. I have to admit, I wanted it to be a little “Eddie-like” in the color scheme. As always, I “ruin” the paint job by blackwashing. And then fixed it again with a lot of dry brushing. I added some detail painting on the nose, around the eyes and lips. Usually I wait until the project is finished to scrape the eyes. But I decided to do it a little early this time. Mazzy was obsessed with this project, particularly the ears. She kept chewing on them! Abby did it too, but just once. So strange. I added whiskers to fill out the thin face. 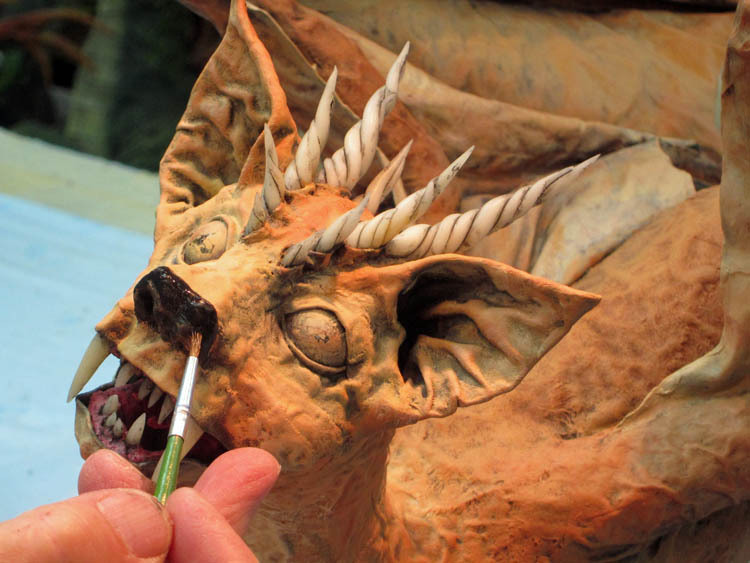 I hot glued clumps of bristles from cheap paint brushes on the jowls and to the ends of the ears and the tail. I like the little tuft on the tail. 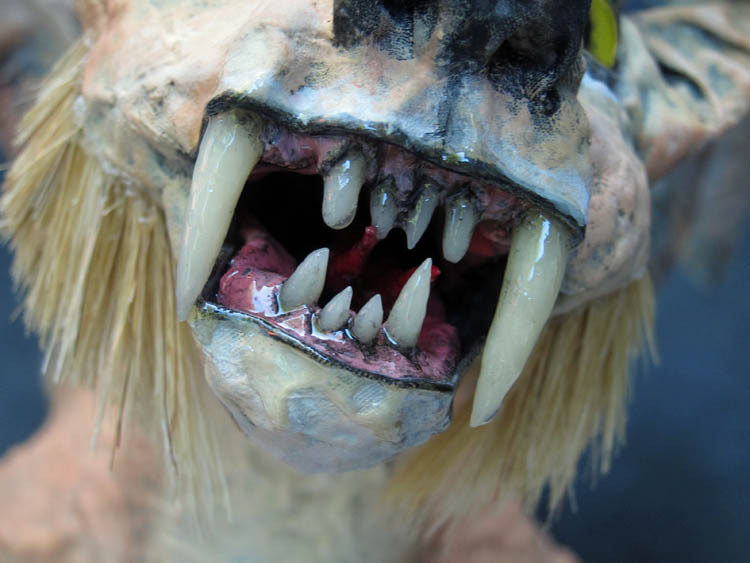 Finally I added some clear casting resin to the mouth just to make it shinier. Had to get a shot of Abby with the project as well. Otherwise she would be jealous of Mazzy. Isn’t she cute (and hasn’t she grown? They grow up so fast. She’ll be ready for college soon.)? And it’s very lanky, the dragon part. Some people said that it didn’t look like a cat because of that. All I can say is that it’s not actually a cat. It’s a cat-like dragon or a dragon-like cat kind of thing. And of course it is not actually real. It is ART. The video will give you a better idea of the project. I’ll be back with something else soon. 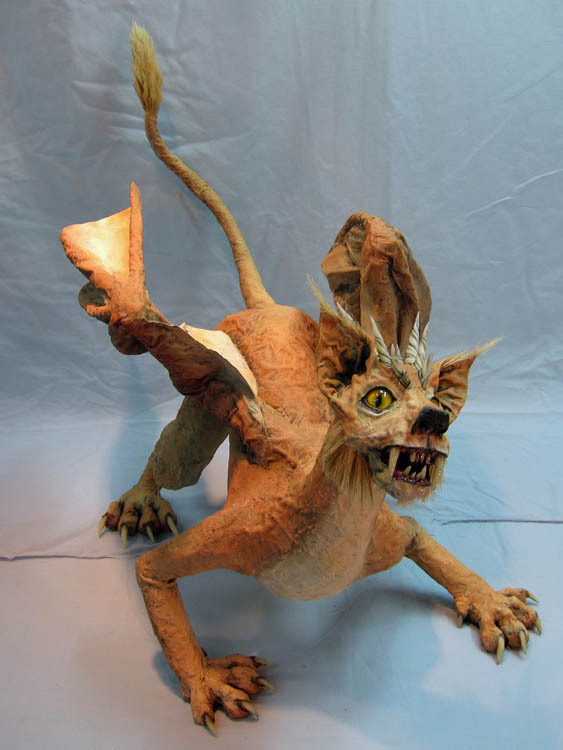 This entry was posted in Paper Mache Dragon-like Cat and tagged dragons, fantasy, mixed media, paper crafts, paper mache, paper mache instructions, papier mache, papier mache recipes, sculpture. Bookmark the permalink. 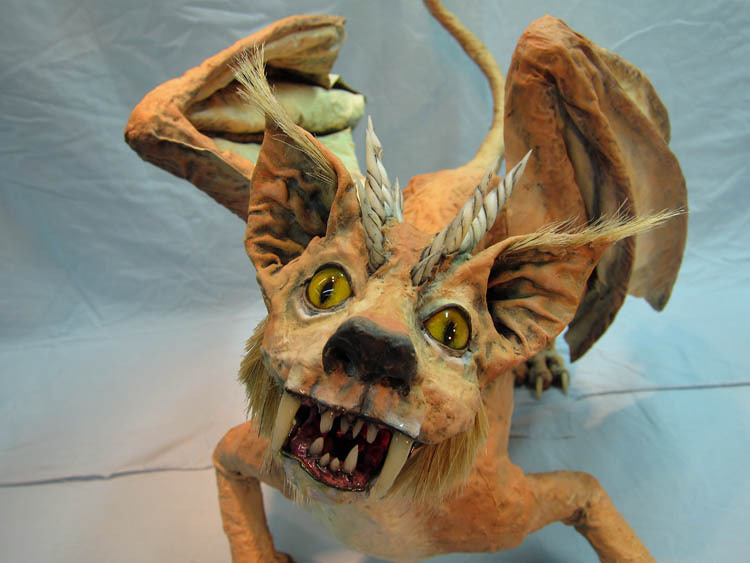 49 Responses to Paper Mache Dragon-like Cat- finished! Thank you Martina. I think Eddie would like it. I appreciate the kind words about him. Perfect combination of cat and dragon! Love it. I love your sculpture! You have inspired me to make several pieces myself (not dragons). Now I’m “feeling the need” to make a few more pieces — only have one left. My main problem is finding a source for wonder eyes like those you use. 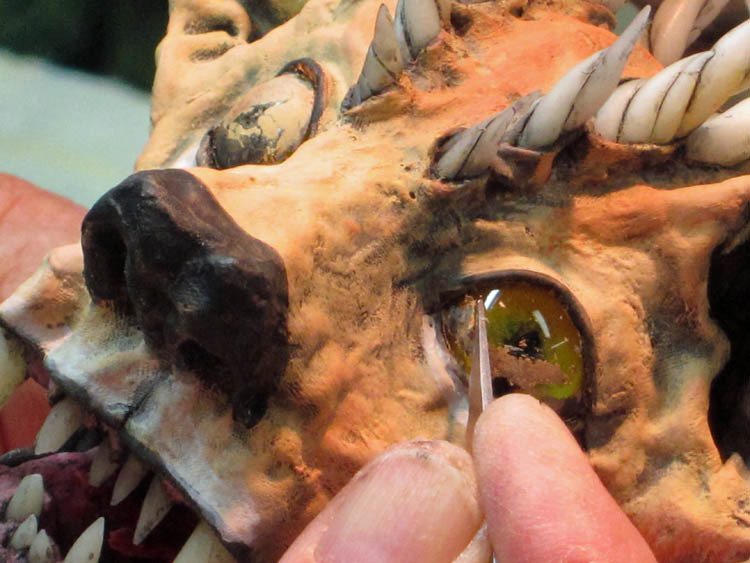 Are you using taxidermy eyes or are you making your own? Thanks Pamela! I buy my eyes online from taxidermy companies. You can buy “blanks” from them as well so you can paint your own. I alter them sometimes with a Drummel tool. Good luck! I love sculpture and working with paper. Even though I don’t have my two cat assistants any more, I now have two terriers that are “raring to” get started. I’ll have to check out some sources for eyes and get started again. Thanks again for you information and inspiration. 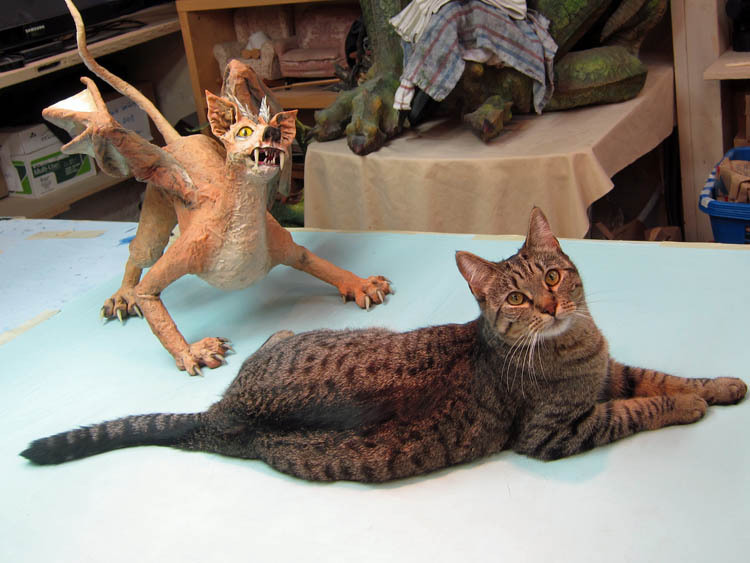 I really like the way you made the cat dragon. He,she looks sweet. I do prefer your dragons but know it’s nice to try something different once in awhile. Thanks Sharon. Yes, it’s hard to stay away from the dragons. Great job as usual! I always love all your creations. Adorable kitty cats, too. I think they approve of your new addition! Thanks Lori! I always appreciate your remarks. Yes, both cats enjoyed this project. Thank you Cath! Absolutely fantastic as your creations always are! Thanks Janice! Glad you don’t think this one is creepy like some people thought. Thank you Julia! Glad you like this one. Thank you as always! Yes, the girls both enjoyed chewing on the ears. Very funny. They had little holes in them that I had to patch. Sharp little teeth! Yes, and that little girl one was too. Cant remember her name. Thanks for the update on a great finished project. It is purrrrfect. 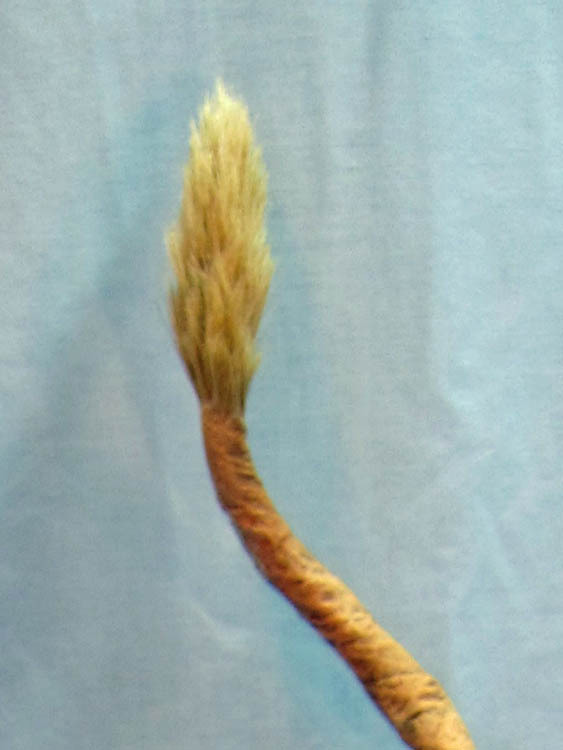 I love the tufts of hair and I’ll try using cheap paint brush bristles for one of my upcoming projects. Thanks Jennifer! Yes, I love those little brushes for many things. Love it! I always look forward to your next creation! Thanks Cynthia! Not sure what to make yet. But I’ll have something soon. Thank you Carol! I hope you are happy and making art “down under.” Thanks as always for stopping by! You’re an absolute master sculpter, love it. Abby is beautiful. Thank you Ralph. That is very nice of you to say! I’ll let Abby know that you like her. But she will just want a treat. 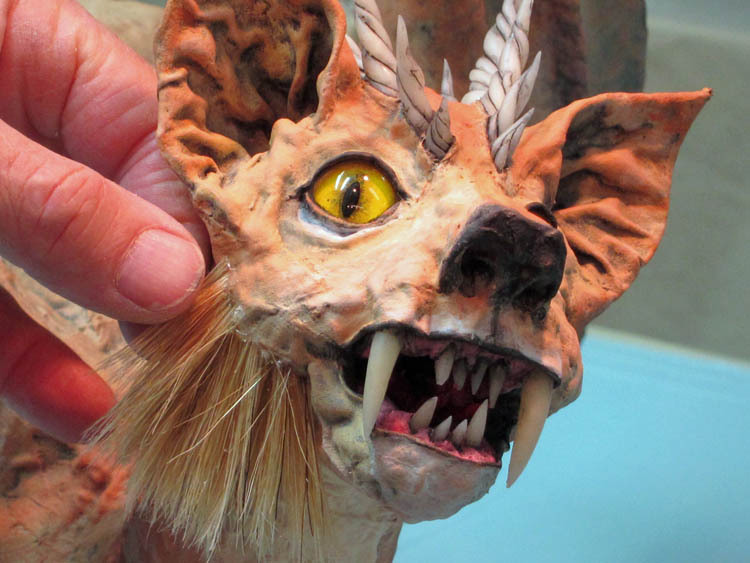 Really love this dragon cat … fabulous face … you are very talented and I love seeing your work. Thank you Jan! Glad you like the face. I thought it turned out well for the long body it sits upon. I appreciate the nice note. WOW! 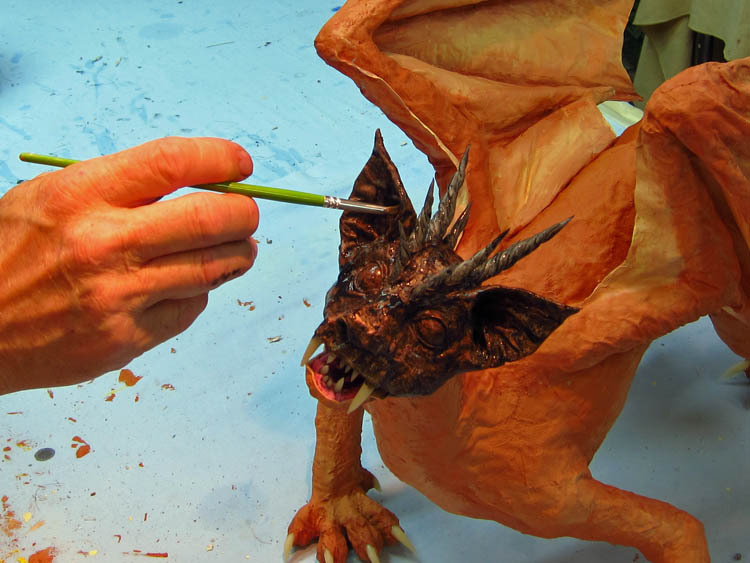 Another great paper mache. Thanks for sharing! I love what you’ve done with his ears! The folds of skin and the little tufts of fur in them are just excellent. So are the horns and mane around his jowls. He looks very playful too, it’s something about the way he’s standing. 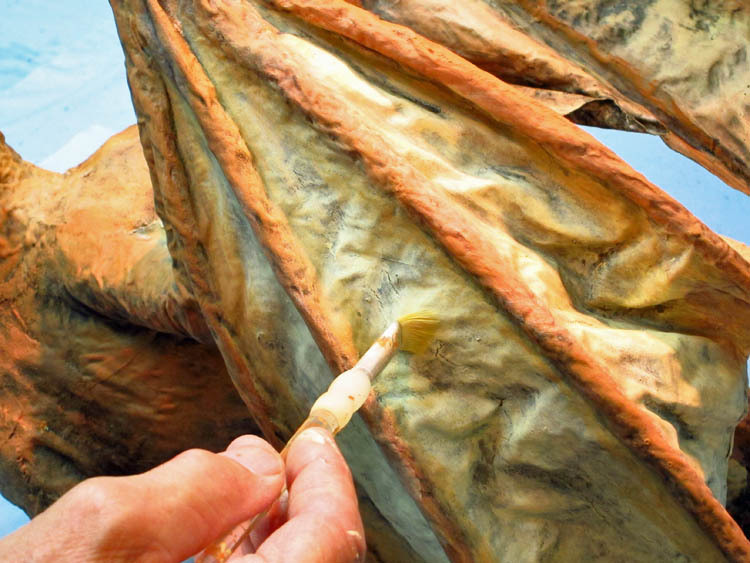 As always, you have a real talent for giving your sculptures personality. Cool project! I like how you’re exploring different subjects for your projects, however, I would like to see you maybe make a smaller piece; all the pieces you make are so big! 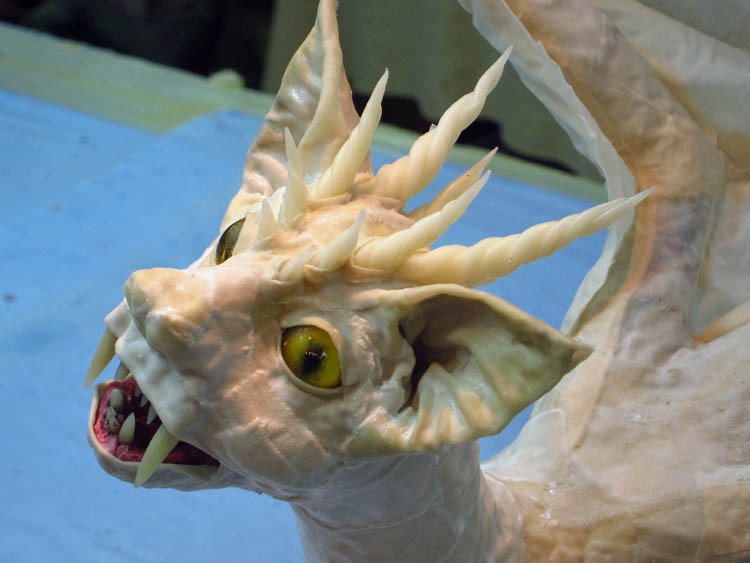 I made a miniature dragon, and I really want to see how you would make one…. 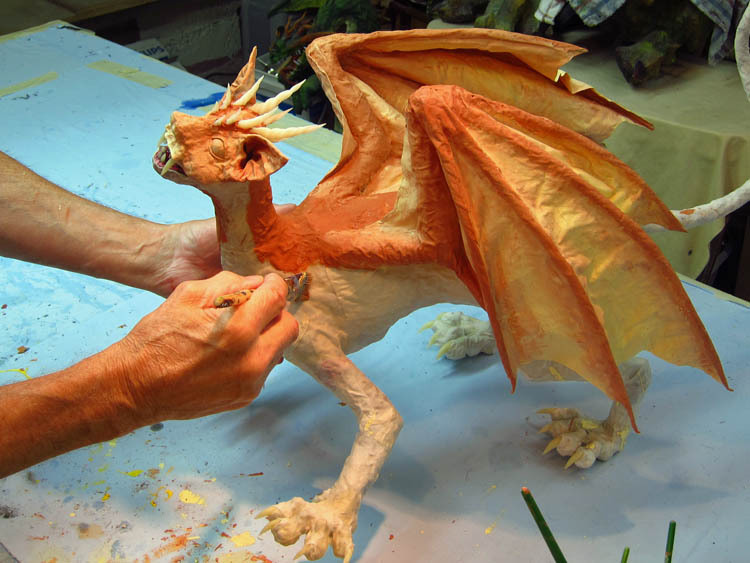 Anyway, you have amazing paper mache skills! I think one of the best features of this medium is that you can make larger pieces. I have made smaller dragons, and it is actually more labor intensive. I prefer the size I’m working in at the moment. But thanks for the kind words. Good luck with you work. Hey Dan, not sure how else to contact you so I’ll do it here… I’m not sure you are aware, but there’s gonna be a national convention of art teachers in Seattle this March 22-24. I was hoping (fingers crossed) to somehow see you on the schedule, but I guess not. I’ll be in the city visiting with my brother (Seattle-based astrologer Rick Merlin Levine) for a few days prior and was wondering if you ever welcome visitors to see your studio. I totally understand. I am retired now – taught for 36 years but still work with kids sometimes and have stayed involved with art teacher groups. But anyhow, if there any of your pieces visible to the public anywhere in or around the city, please let me know. I’m willing to explore almost anywhere, and I’d love to see one of your dragons or other pieces. Hey Dan. Not getting your posts for some reason so I just saw this. I think it it is fabulous. Love that you combined the cat and the dragon. I really don’t see creepy. The face looks mischievous to me. Like she is up to something. Love to see your cat helpers in your videos and stills. I now have a rescue cat and he has become my constant companion. His loose fur that floats around my studio is what helps bind my mâché together. Lol! Have you decided on a new project? 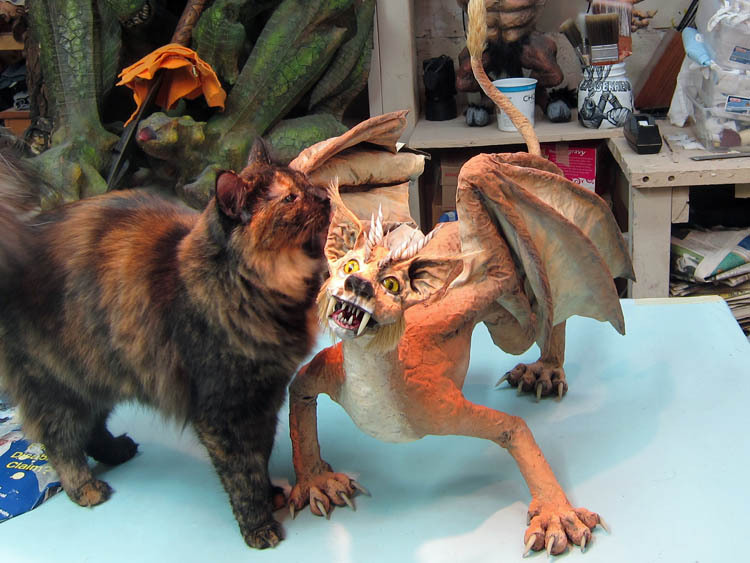 Thanks for the nice comment about my cat/dragon Diann! Hope all is well with you and Tom.